UNITED STATES: Developer US Wind has issued its plans for a 750MW offshore wind project off the US' east coast, a week after Deepwater Wind. The company, a subsidiary of Italian renewable energy firm Renexia, said its plans for a 187-turbine project off Maryland, is under consideration by the state's public service commission (PSC). 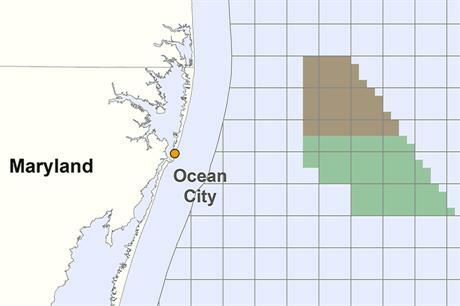 US Wind won the country's third federal lease round in August 2014 for a 323-square-kilometre site located about 18km of the coast of Ocean City, Maryland. "US Wind has already spent more than $20 million to bring this industry to Maryland, and we're prepared to invest much more," said director of project development Paul Rich. "This isn't just about bringing a single project to Maryland — it's about bringing an entire industry to Maryland. We live here, we are hiring here, and we can't wait to start generating clean, renewable Maryland energy," Rich added. US Wind's announcement comes a week after Deepwater Wind — developer of the US' first offshore wind site at Block Island — unveiled its plans for a 120MW project just north of US Wind's proposal. "We welcome the competition, but we feel our proposal is superior in every way," said Rich. "We have a quicker timeline, and our project will provide more clean energy for the state, construct more turbines, create more local steel manufacturing and fabrication jobs, generate more economic benefits and provide the best deal for Maryland ratepayers," he added. In October 2015, US Wind contracted suppliers for a met mast for the Maryland site. "We are the only applicant that has developed detailed engineering designs, conducted multiple offshore marine surveys, built strong ties to Eastern Shore and Baltimore stakeholders, identified prime areas of industrial manufacturing development and applied for the necessary interconnection queue positions from the power grid," Rich said. US Wind also won the federal tender of an offshore wind development parcel off New Jersey in November 2015. The two proposals were issued as part of a 180-day application process launched by the PSC.